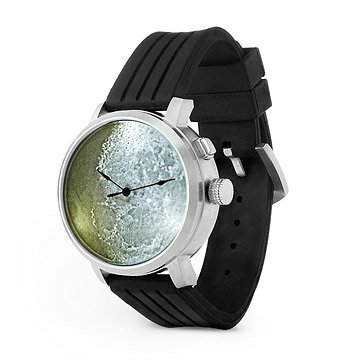 Carry a telescopic view of the moon's rocky surface with this celestial timepiece. Only a handful among us will get the chance to suit up and lift off up through the sky through the furthermost strata of the atmosphere, to land and roam upon our nightly neighbor, the moon. But that doesn't mean the moon's fascinating, craggy surface should always remain a spaceship ride away. You can put the moon on the man (or woman!) with this celestial timepiece that lets you carry a telescopic view of the moon's rocky surface with you whenever the cosmos beckon. A dimensional, realistic image of the moon's surface appears pale gray during the day, but in the dark of night with the push of a button, the wearer can illuminate this astral accessory with a radiant glow. Offering an up-close view of the moon day and night, this unique timepiece is bound to leave both the space fanatic and the casual stargazer alike moonstruck. Alex Goldberg designed and made watches and accessories for various retail chain clients for over 10 years. In 2001 Alex designed his own line of watches. Watches that told the time, yes, but would always do something more (after all, no one really needs a watch these days if you are only interested in knowing the time of day). Alex’s watches incorporate celestial bodies, ancient instruments, color and light to create watches that just do not simply tell time, but tell a story and tell you a little something about the person who chooses to wear that watch. Band: 9.5" L, Face: 1.5" dia. It's a great talking piece, comfortable and adjustable band, great for the corporate world or just everyday. The watch is of high quality, it's nice enough for my husband to wear to the office but also stylish enough to use daily. It is a little bigger than I thought but it's unique and looks really nice! I am giving this to my niece and I am sure she'll love it. It is a gift for my niece and she won't be opening it 'till July 16th. This is a really cool watch. My girlfriend got it for me for my birthday. She thought the face would change through moon cycles, but it doesn't. That really doesn't matter though, because this watch is cool regardless. The light is bright and makes a really cool image. Not the easiest watch to read, but you should understand that just looking at the picture, and if you are really interested you should be willing to take an extra moment to get the time right. At his point I'm not sure if it's water resistant so I'm not taking any chances. The band is rubber and actually pretty cool, though I already broke one of the little rings that holds the extra part of the band down (likely more my fault than the band's). The only (potential) downside is that the casing is pretty bulky and heavy (about 1.5 cm thick). If you like how it looks this doesn't really matter and shouldn't keep you from getting one. Overall a cool watch, and I recommend it. Great gift for my watch collector. Since my husband collects watches, this is a real good item for his collection. He loved it and how it lights up in the dark. It's a great product for everyday use, but especially at night! It's perfect for astronomy lovers, night owls, and anyone who just loves the moon. This is a wonderful watch. But after less than a week, the battery was dead! Not too cool. I just received this today and I am very pleased. It's unique and very stylish. Looks fancy yet sturdy. Others have stated that it's difficult to read the time; I don't think that is an issue. But if I would have to state a con: the box in which the watch is packaged in looks very cheap, making the watch appear cheap, toy-ish like. This is going to be a Christmas present (for my son), and luckily I have time to find another box to wrap it in. Other than that, love it. Am sure my son will love it, too.